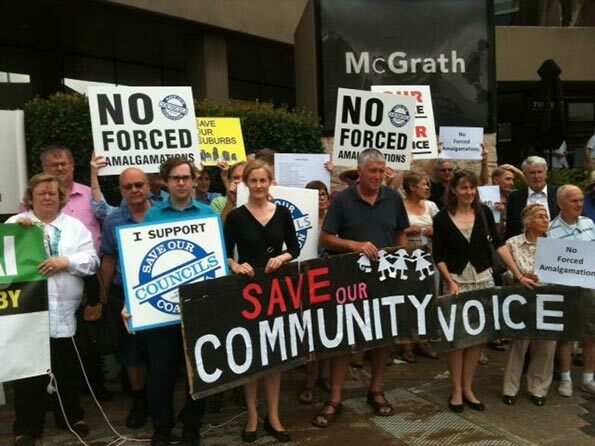 In a rare victory for grassroots activists, The New South Wales Supreme Court has blocked the forced local government amalgamation of northern suburban councils Ku-ring-gai and the Shire of Hornsby in Greater Sydney. The Ku-ring-gai Council had challenged the parliamentary order and lost at a lower court level , but as The Daily Telegraph put it “Ku-ring-gai Council has won its appeal against a forced merger with Hornsby Council this morning in a judgment that was highly critical of the State Government delegate and its process.” The Council was also awarded costs. In particular, the court indicated concern about a failure of statutory duty, lack of public disclosure and insufficient opportunity for public participation. At issue was the recommendation of Delegate Garry West that the forced merger proceed (Delegate West was appointed by the government to make a finding on the government’s forced merger proposal). The Ku-rung-gai Council argued that Delegate West had relied on a merger analysis report by KPMG, a report that the government would not release in public. Writing in the opinion, Judge J. A. Basten said: “The Council was right to assert that the delegate could not properly carry out his function of examination without having access to that material..." and found that “that the financial advantages identified by KPMG for the government were a critical element in favour of the merger, but this analysis was not provided to the delegate or public.” Judge Basten concluded that Mr. West had "constructively failed" in his statutory duty of examining the government's merger proposal, according to the Sydney Morning Herald. Tony Recsei, president of Save Our Suburbs (SOS) NSW, which has opposed the forced mergers, noted that: “Rational justification for wholesale forced council amalgamations was never provided by the Government.” He added: “The amalgamation “consultation” process was laughable in its duplicity. It was glaringly obvious to anyone who participated that the results had been predetermined.” He characterized the court decision as “… a rare win for the community against a dictatorial government and represents a complete trouncing of underhand bureaucratic manipulation.” Demonstrations have been held to oppose the forced mergers (Photo). Deputy Premier John Barilaro had demanded two months ago that the Coalition government abandon its forced amalgamation program. His National Party (the Liberal Party’s coalition partner) had recently lost the Legislative Assembly seat of Orange that it had held for 69 years running, a consequence, at least in part of the government’s forced amalgamation program. The National Party has traditionally been strong in the “bush,” including smaller urban areas (such as Orange), outside the major metropolitan areas of Australia. The National Party usually been the coalition partner of the Liberal Party in government at the federal and state level. A compromise was reached such that “country councils” (outside the Greater Sydney area and where the National Party is strong) will not be required to amalgamate. However, a month ago, the government expressed its intention to continue with the Sydney area amalgamations. In fact, the government could resurrect the Ku-ring-gai Hornsby forced merger proposal. However, Ku-ring-gai Mayor Jennifer Anderson told the ABC (Australian Broadcasting Corporation) that she was “heartened.” She added that “We have had to go to court to get the Government to listen to us and I am seeking a change of heart from the Premier on this issue as a matter of urgency." She cautioned that "If they continue with the merger process, they will be flying in the face of our community and the court." This initiative is the third local government reorganization since 2000 in New South Wales. Like the previous programs, the justification has been anticipated cost savings. Councils were examined for their fiscal sustainability in “Fit for the Future” reviews. Greens spokesman Shoebridge questions the justification for amalgamation. In a Greens of Hornsby website article entitled “Fit for the Future, Fit for the Dustbin,” Shoebridge notes that “When amalgamations have been forced on locals in other states like Victoria and Queensland, rates (taxes) have gone up, services have stagnated and residents end up less connected to the councilors who represent them. In Queensland a number of councils have even begun the expensive process of de-amalgamation, with the Queensland Government bearing the cost of this process.” In that state, the Liberal National government won power promising de-amalgamation votes, yet allowed only four referendums out of the 19 councils seeking relief. All four voted to de-amalgamate. If the Ku-ring-gai amalgamation story sounds familiar, it is. In 2000, the government of Quebec undertook a wholesale program of local government amalgamations. Public reaction was so sharp that the government was defeated at the next election, as the opposition Liberal Party promised de-amalgamation votes. Despite its promises, the Liberals, once elected, required de-amalgamation “yes” votes to equal 35 percent of eligible voters, a prohibitive barrier given the typically low turnouts in local government elections. In the end 32 governments voted to de-amalgamate. In the United States, proposals to force local government amalgamations have not received legislative approval in Pennsylvania, New York, Illinois and Ohio. The Sydney area consultant savings report is also familiar. In 1997, the Ontario government announced a forced amalgamation of six local governments in the Toronto area. The “megacity” as it was called was, according to an accounting firm report commissioned by the government, to save $300 million annually, which was not achieved, according to University of Western Ontario local governance expert Professor Andrew Sancton. Despite overwhelming referendum rejections in six of the cities, the government forced the amalgamation. Ku-ring-gai Mayor Anderson also stressed basic democratic values, the ability of an electorate to control its government, noting that "This merger should not proceed because Ku-ring-gai ratepayers (taxpayers) will be robbed of the means to decide how and where our rates are spent and of any real say in how our local area is managed. These are powerful words. The fight for democracy has been waged for at least the 800 years since Magna Carta and progress has been hard won. Forced amalgamations are anti-democratic and a step backward. It would be one thing if the electorate of Ku-ring-gai had determined that it would be best to amalgamate with Hornsby. But there is a big difference between top-down forced amalgamations and amalgamations that arise from the people themselves. Voluntary amalgamations have a better chance of succeeding than those that are forced. However, forced amalgamations dilute the voice of voters, and without their consent. Usually, as in New South Wales, it is argued that larger government units will be more efficient, exercising economies of scale. The reality is all too often that the economies of scale that are actually achieved are only for special interests, not for the people or their pocket books. 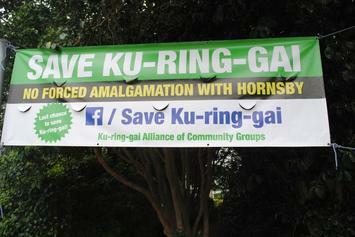 Photograph: Ku-rin-gai anti-forced amalgamation campaign banner, Photography courtesy of Save Our Suburbs (SOS) NSW.